Great way to hide your hand gun and keep it close without being obvious about it. Not lockable, so it is not safe when you have children around, sorry. However if it is important to you to have your gun handy without having to wear it on your person, this is a great way to accomplish that. We have several sizes available. Hidden in plain sight for your security needs when common firearm cases, holsters and safes are simply out of reach or too obvious. The custom protective inlay is made from MR3, a hydrophobic material that will not absorb or draw away the protective oils from your firearm. Modifications can be made to fit aftermarket sights, lasers etc. Simply trim protective material to fit need. BookKASE� is designed to be on its side or stand vertically between other books on a bookshelf. The bottom of the cover is trimmed flat with the �pages� to offer support for the weight of your concealed firearm. Size ML for Medium to Large size pistol. For example a Taurus 92F 9 MM fits with room to spare. Can accommodate semi-autos with up to 6 inch barrels or Revolvers with up to 4 inch barrels. 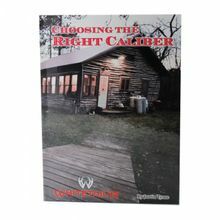 Cover is titled "Choosing the Right Caliber"
Size SM : will accommodate most all small to medium semi-autos up to 4 5/8� barrels as well as 2� snub nose revolvers up to .357 cal. 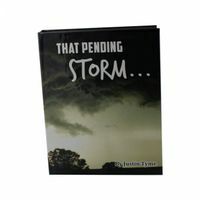 Cover is titled "That Pending Storm".